Sometimes artist portfolios can only contain a couple of comic based pieces, other times one work can be so brilliant, you'd risk being stoned to death by fellow art lovers for putting something else beside it. 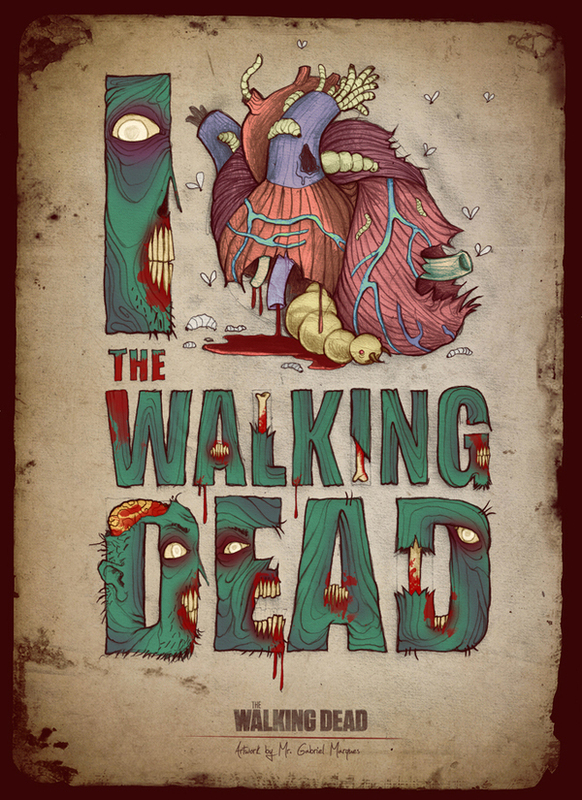 These are Random Works of Wow, and illustrating the point this week is artist Gabriel Marques with The Walking Dead. You know, no matter how tired I get of the amount of zombies running round modern pop culture, I just don't tire of The Walking Dead. I don't know exactly what makes it so different, but after seeing this, I agree, I too (heart) The Walking Dead. Gabriel's online gallery shows a strong passion for Typography in all it's forms - both rotten and not - and you can check out that gallery for your very own self right after the jump.